The best boxing gloves are ones that suit your needs best. Boxing glove sizes vary with their weight but tend to be lighter for women than for men. 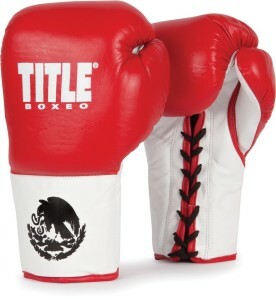 Punching gloves are designed either for fighting, sparring, mitt work or heavy bag work; or combinations of these. 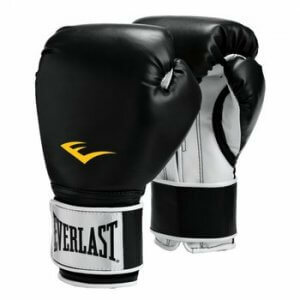 When it comes to boxing gloves brands, there are well-known ones like Everlast and a Mexican boxing gloves brand like Reyes. The density of the internal foam padding is important to protect the hands from damage. The wrist protection is also crucial to avoid the wrist rolling when striking an opponent and damaging the wrist. 2.5 Century Boxing Glove With Diamond Tech? (women’s) Pink 10 oz. The best boxing gloves for beginners depends on what they will be used for. Some people only need gloves for boxercise and other fitness related activities. 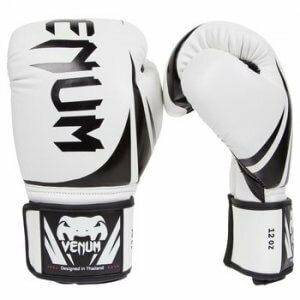 Other people are serious about boxing or Muay Thai and need a pair of gloves that will withstand hitting a heavy hanging bag, pounding some mitts held up for them or a sparring session in the ring. 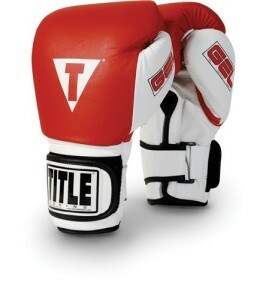 The Title Gel World Bag gloves are for serious training with the heavy bag. The Gel World gloves are some of the best boxing gloves for beginners who aren’t used to using a bag yet. They offer several layers of foam padding to lessen the impact on the hands. The inclusion of gel in the lining improves how the gloves fit once they slide onto the hands and also assist in reducing the impact on the knuckles and fingers. The wrist strap is a wrap-around type and that is perfectly adjustable to suit each fighter. A large separate thumb with ample padding for protection provides confidence. There are black, red and pink color schemes which all use black and white in places. The outer is leather with quality stitching providing longer-lasting protection. The inner compartment for each hand is lined to keep the hands both cool and moisture-free during a bag workout. Not as durable as Everlast or Reyes brand gloves, but good value. The extra layers of foam provide greater hand and knuckle protection, especially for heavier hitters than other bag gloves in this category. The Fairtex Boxing Kickboxing Muay Thai Style Sparring Gloves are designed for Muay Thai fighters, not so many boxers. They are built to withstand heavy bag and pad strikes during Muay Thai training where boxing is an active component of the training regimen. 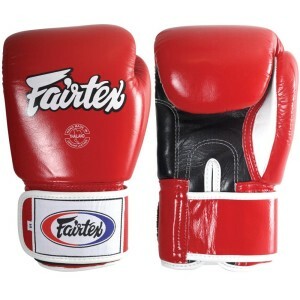 Fairtex gloves are authentically made gloves from Thailand that have been hand-crafted. These ones use quality leather for the main material. There is a hook and loop closure system. Wrists are given good support to avoid injury during practice sessions. The feel is a pillow-like one when sliding the hand inside. There is plenty of space for bulkier hands that have been hand-wrapped to protect them inside the glove. After a single practice session, these gloves feel well broken in and stay just as comfortable with each subsequent use. The quality of the craftsmanship is good enough that you can expect the gloves to last through several years of busy usage. There’s good value for money here despite their affordable price tag. The gloves are sold in 9 color combinations: Black/White, Blue, Blue/Black, Pink/Black, Red, Red/Black, USA flag, White/Black, and Yellow/Black. 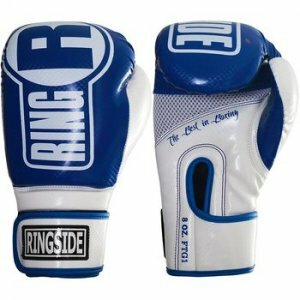 These Ringside Boxing Kickboxing Muay Thai are designed with IMF gel padding aimed at insulating the knuckles from damage during punching impacts. This gel system is likely to let your hands survive longer sparring sessions without taking much damage. from suede on the back which strikes a different look. The cuff is segmented offering a kind of the second wrap for added support. There’s also a hinge built into the upper part of the wrist which adds greater movement of the wrist without difficulty. The gloves don’t look and feel oversized. As boxing gloves, they have a modest total size which is because they’re designed more for straight Muaythai fighters rather than boxers per se. For either mitt work or sparing, these gloves work well. For fitness use like boxercise classes, these would be overkill. Most people get about a year of steady use from these gloves before the gel begins to break down on them. With “The Best in Boxing” tag right on the underside of the gloves, these Ringside Apex Boxing Kickboxing Muay Thai Training Gloves have much to live up to. 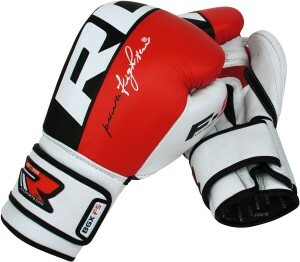 They’re designed for sparing, using the mitts and a punching bag. system provides ample support for the wrist to avoid injuries. The interior padding is injection molded foam rather than layered foam for a complete padding solution. The compartment for each hand is curved by design for a better fist fitting and works well during sparring sessions too. There is a boxing grip bar included which permits a tighter fist. The inclusion of the bar avoids fatigue in either hand during longer sessions. The leather is a synthetic version. The gloves are sold in almost every color of the rainbow; 12 colors in all: Black/Red, Blue/White, Gold/Black, Green/Black, Pink/Grey, Pink/Lime, Purple/White, Red/Black, Silver/Black, White/Black, White/Red and Yellow/Green. Century Boxing Glove With Diamond Tech? (women’s) Pink 10 oz. 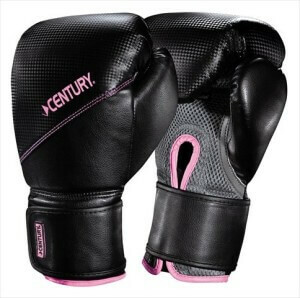 The Century Boxing Glove with Diamond Tech is a woman’s boxing product designed only in black with pink accents. It is a 10-ounce version that should suit women who want a glove with a bit of heft to it. There’s a multi-layered foam padding is said to be high-density to absorb striking blows. The included grip bar has its own padding and helps to keep the fist formed properly. The usual hook and loop system for closing the glove makes it easier to slide the glove on and off. What lets these gloves down is the level of padding. It is insufficient for heavier hitters and even women who don’t necessarily hit that hard feel their knuckles taking the impact and showing the signs of this. It’s possible to break a finger if hitting too hard. 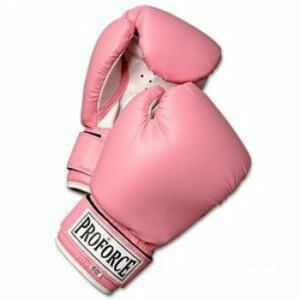 These gloves are far better suited for lady boxercise classes rather than actual sparring or mitt or bag hitting. 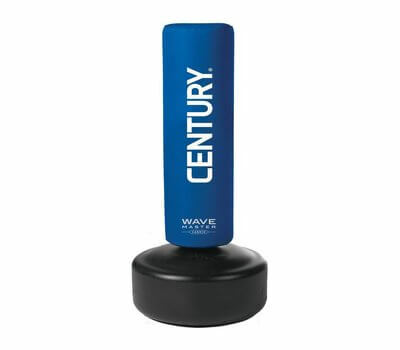 These century boxing gloves aren’t sufficiently padded to protect the hands. 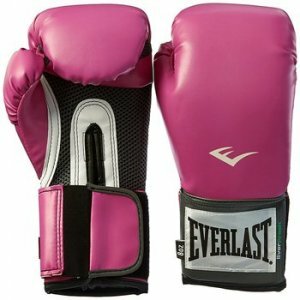 The Everlast Women’s Pro Style Training Gloves the real deal. These synthetic leather gloves are available in pink, blue, black or red. The shape of these gloves looks every bit the boxer’s gloves and feature a Thumb-Lok design for the separate thumb feature. The inner section of the gloves has an EverCool mesh ventilation system to let moisture out. These are cool boxing gloves with an inner hand sleeve comes complete with an anti-microbial treatment to manage sweat and other odors better. The foam inside each glove is closed cell for greater density for better knuckle and finger protection with hard, fast strikes. The fit is redesigned for women to suit their hand and finger shape. These gloves are intended for sparring, mitt or heavy bag workouts making them a good all-round glove for female boxers to purchase. Longer fingers won’t fit the 8-oz. version. 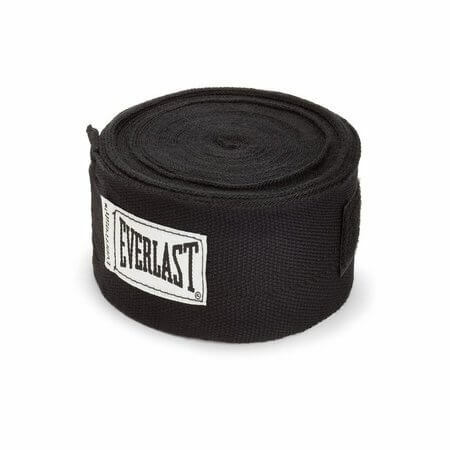 These Everlast MMA heavy bag gloves are designed to withstand serious repetitive strikes into the bag. They have one-inch of closed-cell foam built inside that cushions the knuckles and fingers from damage. This model is only sold in a large / extra-large size. The design incorporates an open thumb design similar to what’s used in Asian markets which permits a more tightly closed fist. The closure system is a wide Velcro strap across the front of the wrist. The hook and loop system is fast to adjust or open to remove the hand altogether. There are EverCool ventilated mesh panels on the underside of the glove to help cool the interior better. The gloves are only 7-8 ounce versions despite their large size. 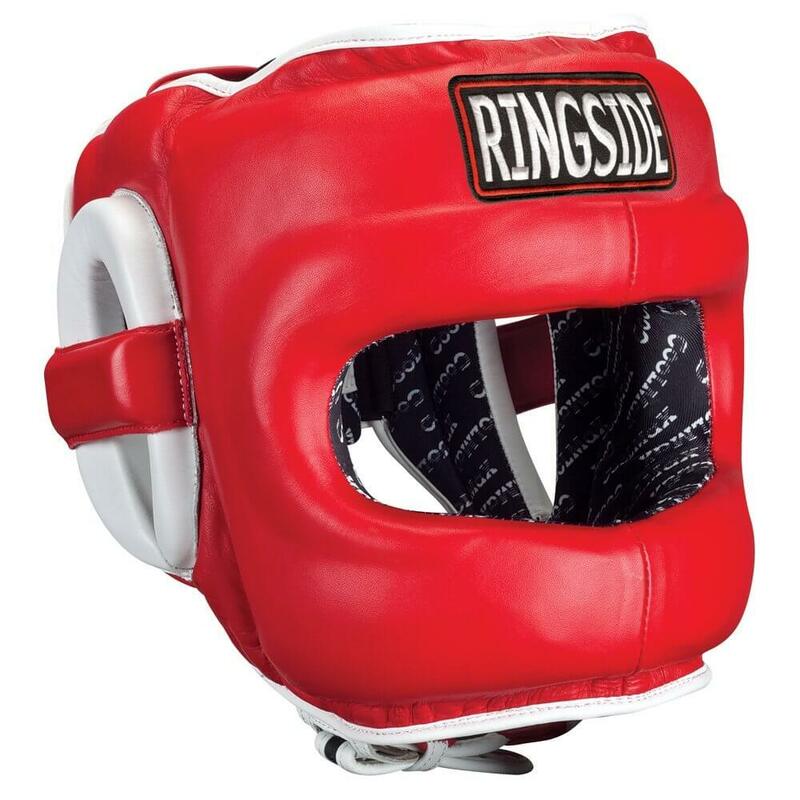 The synthetic plastic surface and padding is only suitable for light use and not sparring or actual fights. Very light bag hits only otherwise these gloves aren’t likely to hold up. For boxercise, they’ll certainly be fine, as will shadow boxing only. 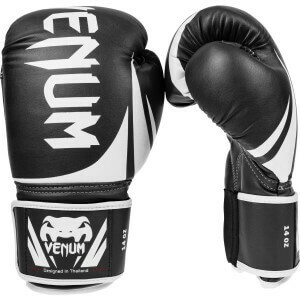 The Venum Challenger 2.0 are affordable gloves made in Thailand. They come in one of 17 colors choices and combinations all with the same basic structure to the product. The glove is produced using PU synthetic material and not leather. It has a mesh inside that makes it more breathable. The thumb is separated completely from the main part of the glove. The foam is triple density foam to mitigate shocks from punching. There is also added protection at the top of the hand too. The foam is layered, not filled. With the various sizes available, men can go to 16 oz or higher and for women, the 12 oz is probably best in most cases. What you’re getting with the Venom brand and this product, in particular, is a wide range of colors and styles. There are many reports of failing internal material and stitching coming apart after just a few uses or over 50 uses. The build quality is just not up to the same standard as premium brand boxing gloves, but then the cost is far lower too. 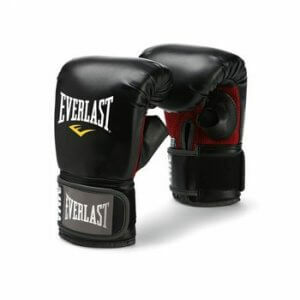 The Everlast Pro Style Training Gloves are good quality gloves for extended training sessions. There is ample wrist padding on either side of it to ensure the wrist doesn’t give way during a strike and cause a fracture. The gloves are sold in Black, Red, Blue and Blue/Green colors. The Evercool mesh ventilation system is present again here to keep the gloves cooler during use and after. The anti-microbial treated lining avoids odor buildup during use. There is good padding all around the glove. Both the wrist and thumb are suitably positioned for striking using the ThumbLok design. Gloves are sold in 8 oz right up to 16 oz sizes for women and men to use. The ProForce Leatherette Boxing Gloves are affordable boxing gloves mainly for use with kickboxing and MuayThai practice. They’re also good for boxercise and fitness classes too. They come in pink outer with a white palm interior. The leatherette material isn’t as durable as leather but is good enough for light use over limited periods. The gloves are sold in sizes 10 oz to 16 oz. They’re pre-shaped to look the part and have a palm with a flexible grip. The hook and loop system allows rapid removal of the gloves. The thumb protection system avoids damaging the thumb when throwing punches too. The foam core is layered in and there is a breathable cotton lining to make these gloves more comfy to wear. These are basic gloves that aren’t for serious boxers or MMA professionals. However, they’re good enough for light use. There many types of boxing gloves. Each has their own uses. Certain cheaper boxing gloves are designed for use in an exercise gym for boxercise, like shadow boxing and other activities that help burn off calories and simulate boxing but aren’t actually used to train for a real boxing match. This is equally valid, but some of these gloves won’t hold up to the real thing whereas some perform double-duty as useful for fitness and also being suitable for real boxing too. Some gloves are specialized ones that are only suitable for one specific use. In the case of heavier fighting gloves, this is true where they’re heavier and must adhere to a specific regulatory body and their rules for the fight. Fitness – These ones are designed for use in boxercise classes, gym exercises where you may hit a bag, but not much more. They’re typically less padded, thinner and less protective of the knuckles, fingers, and hands. They may also provide less padding and support around the wrist area which makes the wrist vulnerable to a break if hitting a bag too hard. These basic gloves are not intended for actual sparing and you need to verify that the product is usable for pad or bag workouts. 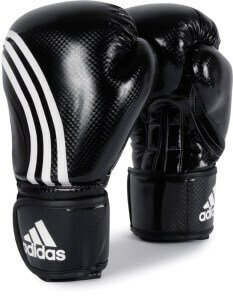 Quite often, these gloves are really for shadow boxing alone which doesn’t require any contact. Sparring – Actually sparring with practice rounds in a fighting ring is usually conducted with 16-ounce gloves and includes additional padding. Most times, the padding in these types of gloves is soft to avoid injuring your hands or your opponent’s body. No other types of gloves will usually be used for sparring because of the risk of injury to either party. Light speed-bag– These types of gloves are intended just to hit the bobbing speed bag as it bounces around. The gloves are light and fast with minimal or no padding at all. They are only to be used with the speed bag and should never be used in any other capacity to avoid breaking your hand or wrist. These gloves are optional as other ones will do in their place for hitting the light speed bag. Heavy bag – The heavy bag is the thick hanging bag that you pound away on. To hit this bag successfully you should use thicker gloves designed for this express purpose. This glove type looks the same and is actually less heavy, but contains much more padding to protect the knuckles and fingers from the beating you’re about to give them. Some special foams and other padding claim to adsorb greater energy levels to avoid issues. For heavy hitters and advanced boxers, special gloves for hitting the heavy bag is important. For beginners or people who don’t hit hard, then using regular boxing gloves is likely to be sufficient. 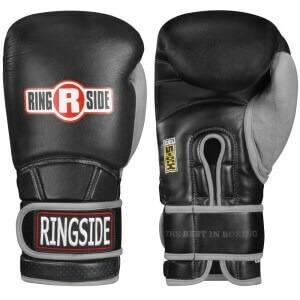 Boxing matches – Gloves for real fights in the ring are premium gloves for the most part. The weight of the glove depends on the regulations laid down by the regulatory body who’s overseeing the event. These types of gloves are focused on a tighter fit to avoid hand movement before, during and after striking hits, the amount of power that it conveys through a hit, and the speed that a glove can move through space to the intended target. These gloves are also the lace-up variety. Major brands of boxing gloves have a fight version, especially for this purpose. Boxing gloves come in all shapes and sizes. There’s not one standard boxing glove and many types to consider (see the above section which breaks down the boxing gloves types more specifically). There are many tiny bones in the hand and especially the wrist, which is easy to break. The human hand is not designed to smash into the body or face of another person, so it breaks easily. The hand and wrist are also notoriously difficult to heal properly and this isn’t quick either. Because of this, both the hand and the wrist require protection when boxing. Cestus in Greece was the earliest recorded case of a type of boxing glove being used as protection. They performed the opposite role of today though; the glove was designed to inflict greater levels of pain and create a bloody fight to please an eager audience. These gloves were a series of leather straps that were very effective in hurting the opponent and breaking their skin. Boxing gloves are designed to focus on the amount of impact exerted. This is both the impact on the hands, fingers, and wrists of the puncher and also what the opponent feels too. When you’re wearing a heavier, large boxing glove, it will tend to take more force through the padding leaving less being projected towards the target. Similarly, less of the impact is felt by the puncher on their own body. For instance, with heavy bag work, the bag is heavy and thick enough that when not wearing specialized heavy bag gloves, more of the force flows through the bag but also back to the hands. The additional jarring could tweak the wrist (or break it) and cause cuts and damage to the fingers and knuckles. This is partly why wraps are used to reduce the cuts and scrapes that occur. Unlike what most beginner boxers might imagine, the goal is not usually to punch with full force like when knocking out an opponent. Doing so will often overextend the boxer putting them off-balance, they’ll get too used to hitting hard with every punch which will quickly exhaust them in a 12-round fight and isn’t practical from a fitness perspective either. Just like with any other kind of exercise, it is a good idea to alternate heavy with light days to reduce overall wear and tear on the body and let it recover faster from the heavy days. Hitting an opponent with 10oz gloves is far more noticeable than hitting them while wearing a 16oz pair of gloves. As such, gloves for sparring are noticeably bigger with extra padding to avoid inflicting real damage on an opponent or hurting the boxer’s hands. The point of sparring is to practice real movements in a fight, get used to the ring size and learn to use it, and use proper boxing technique appropriately. The point is not to knock out your sparring partner in almost all cases. Choosing the right boxing glove for the correct activity both protects yourself and also your opponent from damage. 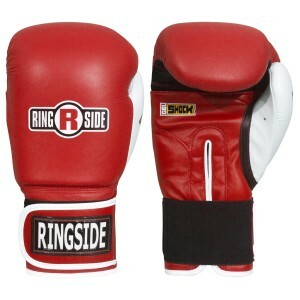 When using boxing equipment, it also protects breaking or damaging the equipment too. Boxing gloves are a far more complex topic than one would imagine. There are many types of gloves available all used for different purposes.There’s no one type of glove that’s suitable for all people. You do tend to get your money’s worth with boxing gloves. 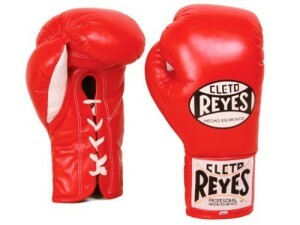 The better budget gets you more protection and a longer-lasting product.We have recommended you always choose branded boxing gloves like winning boxing gloves, Cleto Reyes gloves, rival boxing gloves, Grant boxing gloves which is the famous brand in the world and people trust on it. There are established boxing brands and modern names that haven’t been around too long. The long-established names usually offer better products, period. There are exceptions to this rule, but it still tends to be the case today. Invest when you can in one or more pairs of gloves to cover your needs well and save up a bit more for something better if you can.